Made of polyester. Available in four colours, black, white, blue, and green. Other colours available, call for details. Large mesh, diameter 3.0mm, mesh size 45mm. Medium mesh, diameter 2.7mm, mesh size 45mm. Small mesh, diameter 2.5mm, mesh size 35mm. 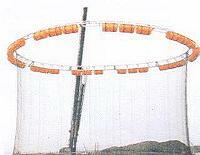 Circular and square fish cages, sandbag covers (during floods), fencing, and in agricultural applications. 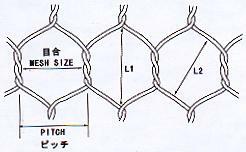 Kikko Net is lightweight and easy to install. It has strength against tears as well as high durability when exposed to UV rays and the elements. It is non-corrosive, non-conductive, inexpensive to maintain, and has resistance against chemicals, seawater, and acids. Kikko Net is also environmentally friendly.